Aguilar suggests that a future version of the device might have a Geiger counter to get initial readings on suspected radioactive areas. A CLUMP of cameras, electronics and LEDs packed into a rubber shell the size of a tennis ball could help firefighters or SWAT teams scout out the potentially dangerous environments they are about to enter. 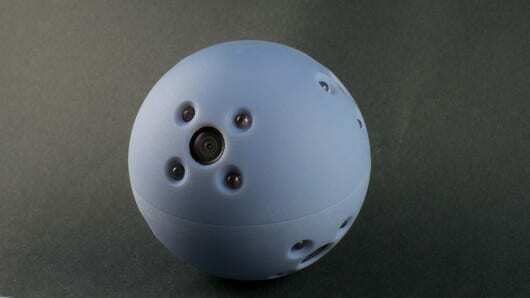 Designed by Boston-based startup Bounce Imaging, the device contains six cameras. When the ball is thrown into an unknown area, the cameras take two photographs per second and send them to a smartphone or laptop, where software knits the images into a 360-degree view of the room. The cameras capture light in the near-infrared range, and the device comes equipped with infrared LEDs, allowing it to build a full panorama of a scene even if it is poorly lit. Bounce founder Francisco Aguilar says the idea for the device came to him after the Haiti earthquake in 2010. He saw the need for a reconnaissance device that would be useful in environments like the damaged buildings of Port-au-Prince. Bernard Hicks, a SWAT-team officer in a major US city, speaking in an unofficial capacity, says that the Bounce device is attractive because it’s easy to use. And at a few hundred dollars, it’s much cheaper than the existing technologies used to image the inside of unknown areas. This means officers won’t have to worry about breaking the equipment.